BERKELEY, Calif. (JTA) — Tali Weinberg walks along the rows of leafy green vegetables poking out of neatly raised beds of soil at Urban Adamah, a newly launched Jewish garden project in this university town. “We’re growing chard, kale, lettuce, summer squash, cucumbers, beans, basil, fennel, dill, tatsoi, broccoli, cabbage,” she said, surveying the garden. Later in the summer, they will add peppers, tomatoes and eggplants. Almost all of it will be donated to two local agencies that feed the poor: a low-income medical clinic and a neighboring church. Urban Adamah is on the cutting edge of a fast-growing phenomenon. 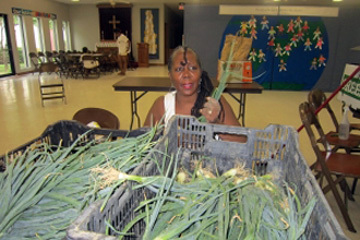 As general interest in food justice and healthy eating intersects with the longstanding Jewish commitment to tzedakah — particularly the commandment to care for the poor and needy — growing numbers of synagogues, Jewish schools, camps, community centers and freestanding Jewish farm projects are planting gardens and donating the produce. And they’re doing so in conscious fulfillment of Jewish values. The Jewish community has a long history of helping the hungry. That used to be centered mostly around holding canned-food drives, giving out free meals, running agencies that help the needy and engaging in political advocacy. But now Jewish groups are also maintaining food gardens and giving away the bounty, reflecting many people’s desire for more hands-on involvement. “Food justice is the cause of this generation,” said agronomist Oran Hesterman, author of “Fair Food” and founder of the Fair Food Network, a nonprofit working to provide underserved populations access to healthy, sustainably grown food. “The No. 1 barrier is not knowledge, but access,” he said. That’s what these Jewish gardens are trying to change. Urban Adamah, built on the site of a former printing press on land used most recently as a parking lot, planted its first crops this spring and officially opened in mid-June. Most of the work is done by a dozen post-college residential fellows who spend three months working the land and learning about farming and the Jewish values related to food and agriculture. The program was developed by Adam Berman, Urban Adamah's executive director, based on a similar program he created at the Isabella Freedman Jewish Retreat Center in Connecticut that produced a cadre of young Jewish farmers and farm educators now in charge of their own projects around the country. They include Kayam Farms in Reistertown, Md., and the Jewish Farm School at Eden Village Camp, N.Y. In Denver, Ekar Farm was launched 20 months ago on unused land belonging to the Denver Academy of Torah, a Modern Orthodox day school. (Watch JTA's video on Ekar Farm.) Last year, the farm grew 8,000 pounds of produce and gave 6,500 pounds of it to the Jewish Family Service Food Pantry. The Ekar staff has helped other local synagogues start their own food gardens. As momentum builds, more and more synagogues, schools, camps and JCCs are getting into the act. Rachel Cohen, sustainability program coordinator for the Religious Action Center of Reform Judaism, says all 13 Reform movement summer camps and more than 20 congregations are doing some kind of food justice work. Some of them are growing and donating food, or leaving the corners of their fields for the poor to come and take what they need — something the Torah instructs. “It’s becoming increasingly integrated into how we think about food justice in general,” Cohen said. Temple Shalom, a Reform congregation in Aberdeen, N.J., started Gan Tikvah, the “garden of hope,” in January 2010. Partnering with Conservative Temple Beth Ahm, volunteers broke ground that May, harvested their first crop in the summer and eventually donated 400 pounds of vegetables to the Matawan United Methodist Church to be consumed by the poor. Organizer Lenore Robinson says it’s the first time the three institutions have worked together. “We’ve created a real community that we never had before,” she said. In Chicago’s Hyde Park neighborhood, KAM Isaiah Israel Congregation planted its first food garden in 2009 and now grows organic produce on 2,500 square feet of what used to be the synagogue lawn. Last year, they delivered more than 1,200 pounds of food to two soup kitchens and a shelter for women and children. This spring, the synagogue’s social justice committee used a grant from One Chicago, One Nation, a community organizing group, to plant a 1,000 square-foot garden at a nearby church in this largely impoverished neighborhood, says committee chair Robert Nevel. A second garden at another church will follow, and the synagogue is developing a model to help other shuls set up their own urban gardens. 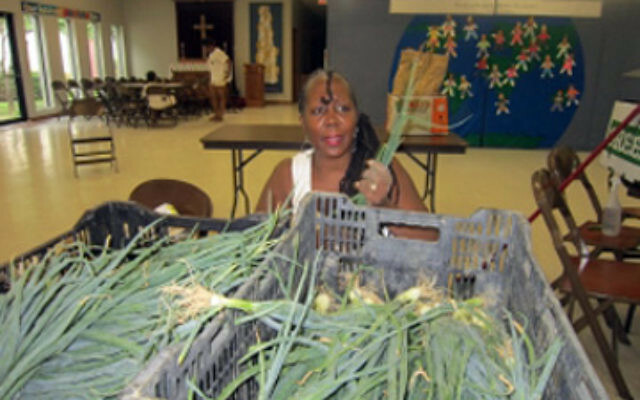 The phenomenon is still new, but it’s answering a need expressed by the emergency food system itself, said Mia Hubbard, grants director for Mazon, a national Jewish nonprofit dedicated to alleviating hunger. Until recently, she said, agencies focused mainly on getting food into people’s mouths. But over the past five years, as awareness of childhood obesity and the connection between nutrition and health care costs has grown, food banks and soup kitchens have been paying more attention to the nutritional aspects of the food they give out. “There’s been a significant interest in and commitment to increasing the availability of healthy food,” Hubbard said. Some will no longer accept donations of soda pop or sugary cereals. But getting enough fresh produce isn’t always easy, according to Hubbard. Last November, the Jewish Community Centers of North America launched JCC Grows, a campaign to get every center and JCC camp to grow its own food garden, and to donate a portion of their produce to the hungry. Barbara Lerman-Golomb, social responsibility consultant for the JCC Assocation, says a recent survey showed 25 JCCs have their own on-site gardens, and more than half give away at least some of what they grow. The cumulative impact of these initiatives may still be small, said Hubbard, but they’re heading in the right direction.